A special Thank you to Harlequin Teen and NetGalley for this book to review. I'm so loving this! 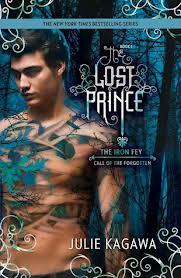 I read the whole Iron Fey series from the get go and I really enjoyed them all. I was so excited to find out that we'd get another series! This is Ethan's story. He's Meghan's younger brother. Remember him? He was the one kidnapped by the faeries in the first book and kick started this whole thing. I absolutely love his point of view. I really find a male POV to be refreshing and so new to what is out there right now. He's got a whole thing going on about him and how he feels about the faeries as well as his sister The Iron Queen. He is a student of Kali a Filipino martial art that uses sticks, swords and knives. He wanted to learn to protect himself from the fey. I watched several youtube video's about it just I could accurately picture what Ethan was doing. It really intrigued me the further we got into the story and I just had to know. Ethan and his new friend Kenzie have to go into the Iron Realm to talk to Meghan about disappearing faeries. Not to mention to save their life at the moment. All sorts of things happen while they are there. Ethan knows how to deal with the fey, but Kenzie doesn't. She doesn't know she should make deals with them or make promises of any kind. She doesn't know how dangerous they are. Ethan and Kenzie get themselves into many predicaments along the way to Meghan and trying to save the fey. The world is expertly crafted and you get a really good picture at what is going on. There are so many facets to the Nevernever that I'm sure there could be a million different spin off series just from what we've seen so far. The story lagged in the middle a bit for me, but it was over all very entertaining. We get to see a bit of our favorite character's Meghan, Ash and Puck along the way. Oh, and Grim too. I liked this even more than The Iron Fey. I'm a sucker for Ethan! Can't wait for more of his voice. I loved it!